Chionanthus or ‘Fringe Tree‘ a very hardy tree. Masses of white snow white, fragrant strap shaped flowers in panicles cover the tree in summer. Chionanthus can handle full sun or partial shade and are a tough small tree. The two most widely grown species in Australia are C. retusus and C.virginicus. 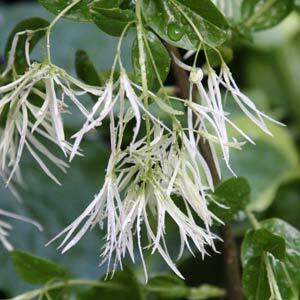 The Chinese fringe tree is one that copes well with higher pH soils as does the American species, however both are very hardy. Flowers are finer on the American species. Chionanthus ramiflora – Also known as the native olive, this is not a prolific when in flower as the other two species. More of a sub tropical species. Chionanthus retusus (Chinese Fringetree) – When in full flower the silky white blooms make this an attractive addition to any garden. The flowers are fragrant and the foliage attractive through the season. C (White Fringetree) – This is a North American species , a small to medium sized tree, reaching a height of 3 -5m depending on conditions. Excellent as a shade tree and a good specimen tree in medium sized gardens.